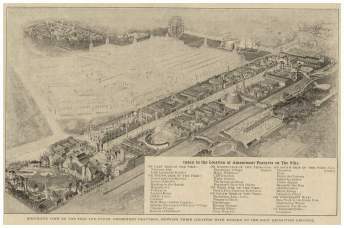 The reproduction of the Marketplace of Triana and Gypsy Lane of Barcelona, allowed visitors to browse and buy many Spanish wares. The marketplace also included a cafe, while the Gypsy Lane contained more entertainers, dressed in colorful street garb. The Theater de Los Flores featured Spanish dancers and music, and a marionette with model bull fight. There was a life-like bullfight model, with 200 figures 28 inches in height. One could see burros walking down the street with jugs of water for patrons to drink. In a separate entrance for "Girl from Madrid", Spanish fashions from village girls to aristocracy were shown and was very popular with the lady visitors. 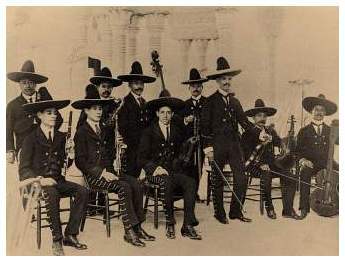 A mariachi band from the Seville attraction. 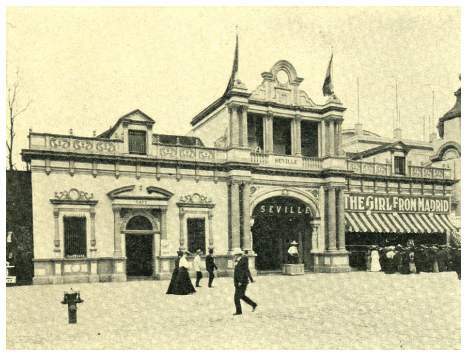 Streets of Seville (picture sent and courtesy of Mike Truax 1904 WFS president).